Americans find themselves in a time of unlimited information. A time of vast intercommunication wherein people are beginning to see the lies they have been fed since their eyes opened to the world. The many are once again beginning to open their eyes to the vivid lies of the few. There have been many deceptions in the history of this great nation. Many a deceitful choice full of injustice and pride. One would think in the present era, full of simultaneous possibility and imminent destruction, that a country such as the United States would cast aside any such past indiscretions and strike forward into a future rich with solidarity and purpose. However the reality is much more disheartening and expected. It appears the government thinks very little of the people’s deductive logic skills. Those who think the United States is in an age of pure intentions and selfless dedication, are not allowing themselves to see what is right in front of them. All one must do is look back at every civilization, including this country, to see the repetition of selfish and personally driven agendas behind the scenes of any potentially profitable situation. It is simply human nature. To think that this country is in a time where decisions are only made for the betterment of the people with no hint of personal gain is just naïve. That’s not to say that there aren’t those out there, or those from this country’s past, that possessed the rare collection of attributes that this nation used to require of those allowed to lead. In most cases, the United States will not get involved in a situation unless there is a potentially beneficial upswing. That is understandable, if not responsible, in the majority of circumstances. However, in some cases America puts on the hat of “global referee” and stands on its holier-than-thou platform, claiming to the world that it is the “duty” of the United States to get involved, while picking and choosing who and what to help based on its own agenda. The drug war is no different. In the beginning, Americans were wholeheartedly behind the attempt to clean up this country and eradicate the supposed evils of drug use. The problem was acknowledged and the people trusted the government to choose the correct path to alleviate it. As time went on, it became clear that the actions taken only seemed to inflame an already growing problem by putting the power, once again, in the hands of criminals. In 1919, prohibition of alcohol created and incubated the beginnings of organized crime in the United States. By 1920, gang war had taken over the alcohol industry and homicide increased dramatically. What tends to be left out of that common knowledge is that while the criminal’s profit increased, so did the profit of those who allowed prohibition to continue even while seeing its true colors. The same has been seen in the prohibition of drugs. Over 2.5 trillion dollars has been lost to the war on drugs and the result is drug related crime continuing to rise, as the amount of drug trade coincides. The people are now calling for something new. The popular opinion has shifted, and yet the Obama administration has strongly defended the actions that have been taken and chose to escalate the war despite the abundance of evidence that suggests otherwise. A United Nations study shows that drug use has increased exponentially in both opiate and cocaine use by more than 30 percent, and that due to arrests of nonviolent crimes, the prison population has increased twelvefold since the beginning of the drug war. The war on drugs, similar to the war on terror, is one of those situations with a ‘potentially beneficial upswing’ set up to benefit specific profiteering companies that stand to gain far more than they claim the drug trade will lose. From private military contractors, the private prison industry, all the way to US banking system, money is being made on a scale unprecedented before the war on drugs. Funded by Defense and State Departments, billions of dollars have been wasted on private contractors without any oversight or accountability. The private prison industry is directly tied to the war on drugs for a vast amount of its current revenue. One of the largest private companies, Corrections Corp. of America (CCA) has donated 4.5 million dollars to different campaigns and spent 18 million dollars in lobbying. These private prisons contain large amounts of low-level drug users. They have rehabilitation programs and even their own drug sniffing dogs, all funded by the war on drugs. In 2010 CCA had a revenue of 1.67 billion dollars. The US banking industry is where it gets quite unnerving. 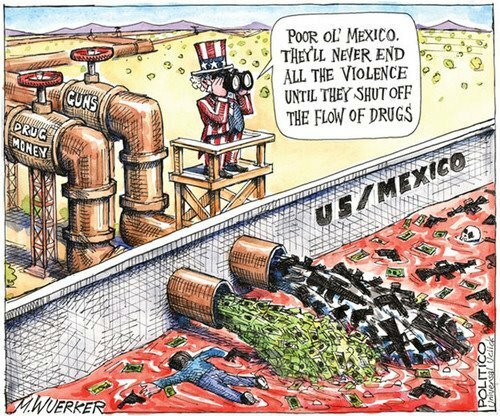 When one truly breaks it down, the majority of drug cartels would cease to exist without the United States, at least at the level that they currently function. This type of hypocrisy has become commonplace within the American political system. For example, the United States is the only industrialized nation that bans the growth of hemp, yet the nation consumes a large percentage of the world’s supply. It is this very outcry for change on the outside, while consuming and profiting behind the scenes, that is tearing down this country. These cartels rely on their ability to launder money through the US banking system to maintain the level of business they currently possess. These are industries that generate billions of dollars in profit that change hands all the way to the top. The profit is made not by creating change for the better, but rather inhibiting it. The majority of Americans are flat-out tired of the drug war and are aware of its failure. The people ask for change and get more impotent results and steps in the opposite direction. Nothing will change until the people can find a unified voice once again. To stand united and cry out for all that was once known of America’s great leaders. Truth. Accountability. Honor.